With an average depth of five feet, our lake provides for a wealth of water-related activities. Swimming is excellent! Our fish population includes large-mouth and small-mouth bass, crappies, sunfish, blue gills, pickerel, catfish, and perch, among others. Members and their guests enjoy both open-water fishing and ice fishing. 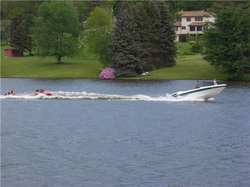 Powerboats of all sizes and configurations, canoes, sailboats, kayaks, and personal water craft are regular sights on the lake; skiers and tubers love the recreational opportunities presented. Gasoline and electric motors are permitted with no current restrictions on horsepower nor on launch dates. All water vehicles using the lake are required to be registered with the Association and bear a registration decal for identification purposes.Guest passes are also available which identify guests of members and permit them to use the lake facility. A pass must be displayed by guests when using a park area or the boat-launch/dam area. Guests on board members' registered boats or those on lake-front properties do not need guest passes. Members and guests are required to know and abide by the rules and regulations of the Association, and those of the U.S. Coast Guard and the Pennsylvania Fish and Boat Commission including licensing of operators and anglers.